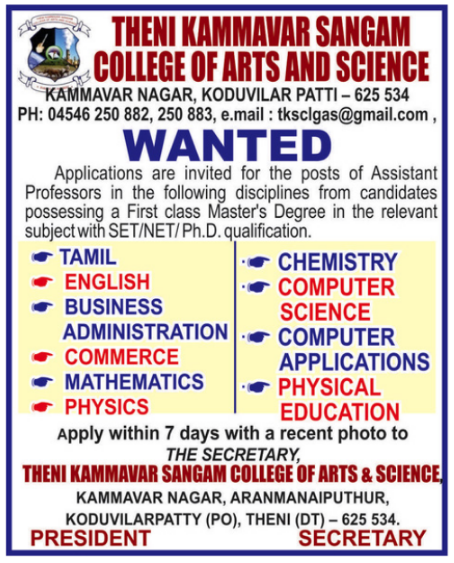 Theni Kammavar Sangam College of Arts and Science, Theni has advertised in the DINAMALAR newspaper for recruitment of Assistant Professor jobs vacancies. Interested and eligible job aspirants are requested to apply within 07 days from 07th April 2019. Check out further more details below. About College : Theni Kammavar Sangam was established in the year 1972 by the service minded philanthropists of Kammavar Community with the aim of providing good value based education to the poor and rural area students. With the aim of developing rural area into technology forefront, the society started Theni Kammavar Sangam College of Arts & Science in 2007.